THE OPENER by John Triptych. Beneath the gleaming new economies of South-East Asia there exists an underworld of transgression, vice and rampant corruption. Abandoning recession-plagued America for the easy money of Asia’s lucrative, entirely illegal boiler-room industry, Don Rouse must navigate through a sordid world of drug addicts, deviants, prostitutes and professional conmen. His world suddenly turns upside down when the police show up and his boss goes missing. Don is plunged into a high stakes mystery that could very well put an end to his criminal career… perhaps even his life. From the fleshpots of Bangkok to the gritty streets of Manila, this novel sheds a new light on the little known world of organised international crime – and is suggested for mature readers. ALL THE HELP YOU NEED by Sean Preciado Genell. Cab driver Vic meets more strangers in a night than most people do in a year. Prone to bad luck, he prowls the streets of Iowa City, trying to scrape together enough money to move out of his crumbling garage. When Vic helps a fellow driver take revenge on a couple young punks who’ve been robbing taxi cabs, they spark off a chain reaction that thrusts them into an underworld of poser gangbangers, desperate bikers, prostitutes, methheads, human traffickers and a truckload of hungry Bengal tigers. For Vic to make it out of this alive, he’s gonna need all the help he can get. THE MULBERRY BUSH by Charles McCarry. Revenge, espionage and even a love story, wrapped in spirals around a twisting plot. Entwines global significance with a cerebral, compelling plot which more than stands comparison to Le Carre’s best. Intelligent and challenging, but more slow-burn than a rapid read. DUST AND DESIRE by Conrad Williams. A gritty, gripping and explicit thriller. PI Joel Sorrell is approached by the mysterious Kara, desperate to find her missing brother. Joel takes on the case but almost immediately, an attempt his made on his life. The body count increases. And then Kara vanishes too… as those close to Joel are sucked into his nightmare, he realises he must track down the killer if he is to halt a grisly masterplan – even if it means sacrificing his own life. SCAR TISSUE by Trace Conger. Underground PI Finn Harding discovers an acquaintance is entangled in a smuggling operation, so he negotiates a deal with an Indianapolis criminal organisation to earn his friend’s freedom. But freedom doesn’t come cheap. To fulfil his obligation, Finn must locate an anonymous criminal banker who skipped town with $5 million. But how do you find a man with no name, no identity, and no known location? Finn must rely on his skill, cunning, and an unlikely connection from his past to find the banker and the cash before time runs out. LONGING by RM Gauthier. Longing is a novella about two men coming together, one out for justice, the other revenge. Leroy returns home after eight years in the Special Forces to discover his nightmare has not ended, but just began. His sister has been missing for months, so Leroy sets out on a mission to find and bring her home. Meeting business tycoon Landon Miller exposes Leroy to a world of corruption he had no idea existed. DIES IRAE by BV Lawson. Three years ago, Scott Drayco left the FBI after an incident involving his partner. Now a freelance crime consultant, Drayco never imagined his estranged former partner would turn up on his doorstep, pleading for help. A co-ed at an elite private college has been murdered, and the victim’s friend – his ex-partner’s daughter – might be the next target. The killer left behind a puzzling music code at the crime scene, and Drayco soon learns he has two things in common with the murdered girl; a music background and synesthesia. The case takes an even stranger turn after a second murder and a second music code, with signs pointing toward a possible ritualistic killing. Drayco finds himself locked in a deadly game with a madman where only one of them may come out alive. CORRUPTION OF POWER by George Eccles. Independent troubleshooter Alex Leksin is recruited by President Karpev when the plan to reduce Russia’s reliance on an ever more hostile Europe is put at risk. The president’s strategy is to shift the markets for his country’s energy to the East. Failure could mean catastrophe. Against a background of political corruption, state-sponsored terrorism and increased Taliban insurgency, Leksin’s investigations take him from Moscow to Turkmenistan. Wherever Leksin goes, someone tries to kill him; people in a position to help him are assassinated; and information turns out to be misinformation. And when at last he discovers the truth, he’s no longer sure whom he can trust. DECEITS OF BORNEO by HN Wake. Haunted by her last mission, young CIA operative Mac Ambrose craves a fresh start. But a call interrupts her undercover assignment in Hong Kong – a fellow spy is missing. Mac plunges into Malaysia’s rainforest to track down the wily Josh Halloway. The search soon uncovers a mysterious murder with links to a powerful timber corporation. Soon Mac finds herself entangled in a conspiracy of international finance, environmental destruction, and national security. What will she risk to help Josh right his wrongs? How far will she go to expose the truth? 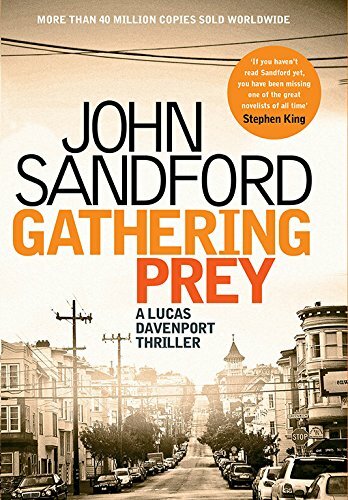 GATHERING PREY by John Sandford. The 25th book in the ‘Prey’ series sees Lucas Davenport return to investigate a series of killings among the traveller community. While the later ‘prey’ books don’t have anything like the punch of Sandford’s early thrillers, they’re still reliably well-constructed novels which feature coherent plotting and a snappy turn of phrase. Reblogged this on Michael P King. The Traveling Man sounds great!! Thanks for sharing this list with your readers.